The Penguins have re-signed defenseman Steve Wagner to a two way contract. The contract, worth 500k, is a one year deal. 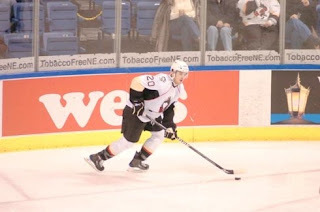 Wagner's contract was up after being acquired by the Pens in February in exchange for Nate Guenin. Wagner played only 20 games last season with the Pens, but has several seasons of experience with Peoria and their NHL affiliate St Louis. Wagner is not expected to make much of an impact with the big club, but I think this is a very good move from the prospective of Wilkes-Barre/Scranton. He is a very mobile blueliner who can get pucks to the net as well as get back in time to defend. His positioning is sometimes a bit off and he needs a bit more work on his puck handling skills, but he fits in very well into the Wilkes-Barre/Scranton system. With the likely departure of Ben Lovejoy up to the NHL and the potential of Engelland being called up a few times, it would mean that Wagner is one of the veteran leaders on the team. He has NHL and AHL experience, and can provide leadership to some of the younger defensemen (Bortuzzo, Strait, Caffaro). All in all, signing Wagner was yet another good depth move made by the Pens so far this offseason. Some of the more high-profile moves are beginning to be made across the NHL, so expect decisions to be made on Cooke, Gonchar, Eaton and others sometime soon. Seems like he is better than Guenin and could be a reasonable option to fill in for an injured blueliner with the big club.